Recently, I have encountered two occasions of owner funded tenant improvements in an existing industrial building - or I should say a request for owner funded tenant improvements. I believe the topic is post worthy as the question arises quite frequently. 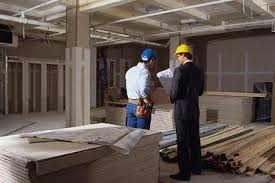 Definition: According to the Certified Commercial Investment Membership Institute "CCIM", the real estate definition of leasehold improvements, also known as tenant improvements (TI), is "the customized alterations a building owner makes to rental space as part of a lease agreement, in order to configure the space for the needs of that particular tenant." I am limiting the discussion in this post to an industrial space that has been previously occupied vs. an office space that is in shell (no walls, ceilings, or flooring) condition. Cost: An owner will generally compute the total consideration of the lease by multiplying the monthly rent (including contractual increases throughout the term) by the term of the lease. This amount is the gross amount of revenue that the owner will receive from the tenant over the term of the lease. Based upon this figure, an owner may be willing to invest a small percentage of the future income to secure a tenant. Items such as painting and carpeting the office areas and possibly painting the warehouse walls are considered necessary refurbishment to make the space lease ready. Tenant improvements generally refer to something over and above normal turnover refurbishment. So, as an example, if a tenant requested that new lighting be installed in the warehouse at a cost of $10,000 and the total consideration of the lease was $1,000,000, chances are great (assuming the factors below are also in line) that the owner would fund this request. However, if the tenant requested that the power service be ungraded at a cost of $100,000 and the lease consideration was $750,000, an arm wrestling match would ensue. Available Resources: AKA, the amount of cash that an owner has on hand to fund tenant improvements. Generally, an owner will build up a tenant improvement "slush fund" from the rents received to handle future refurbishment costs (paint, carpet, etc.). Most commercial real estate lenders will require a reserve for tenant improvements so that the owner won't spend all of the rents and jeopardize his ability to rent the space if the tenant vacates. If an owner is cash poor and a tenant requests a tenant improvement, an owner may ask the tenant to pay for the improvement and offset the cost of the improvement by an amount of free rent. Nature of the Improvements: With the definition above, the word "customized" jumped out at me. Customized connotes some special purpose improvement that will not find appeal with the next tenant in the space. This is one of the criteria from which an owner bases his decision to pay for an improvement. The last thing an owner wants to do is to pay for an improvement that must be removed in order to lease the space the next go around. Generally, additional office space falls into this category. Most industrial tenants don't require a great percentage of office space compared to warehouse space. Therefore, if a building is "over improved" with too much office space, the building could be un-marketable. The opposite would be true of an improvement in the truck loading. If a tenant requested that truck hi loading be installed, the value would be universal and the improvement investment a wise one.